Once or twice each decade, Hawaii sends Los Angeles a big, wet kiss. Sweeping far south of its usual path, the westerly jet stream hijacks warm water-laden air from the Hawaiian archipelago and hurls it toward the Southern California coast. This “Kona” storm system—dubbed the “Pineapple Express” by television weather reporters—often carries...the equivalent of half Los Angeles' annual precipitation. 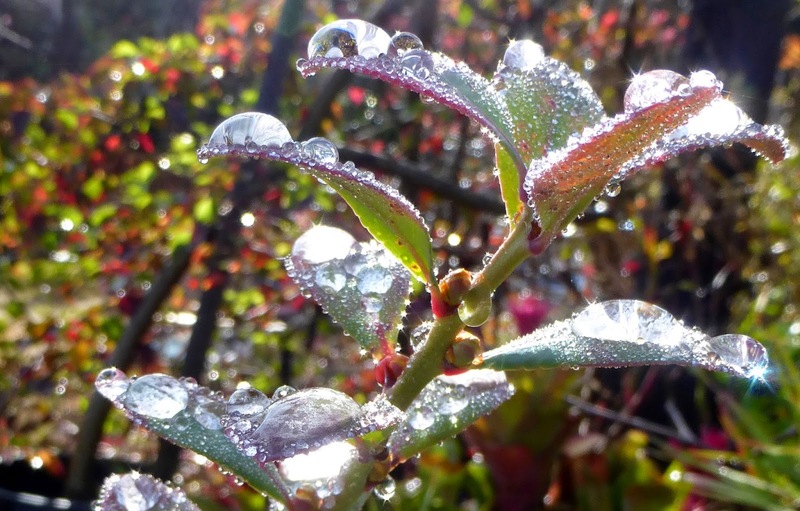 This week, the Pineapple Express delivered the first extended Southern California rainstorm in almost two years, bringing between two and four inches of rain to most parts of Malibu and the Santa Monica Mountains. Malibu residents found themselves almost entirely isolated from the rest of the world on December 3, when mud, rockslides, traffic accidents and downed power lines caused all of the major roads in and out of town to be shut down for a time. The impact of the storm may have caught some of our newer residents by surprise, but longtime Malibu residents expect the canyon roads and Pacific Coast Highway to be blocked by rocks and debris during storm events, especially when heavy rains follow wildfires like the 2013 Springs Fire. Nearly 10 miles of PCH north of Yerba Buena remained closed until late Thursday this week, while crews cleared mud and rocks out of the road, but on the whole, Malibu got off lightly this time. That isn't always the case. Pacific Coast Highway—or what was left of it—looking towards Malibu from the intersection at Chautauqua during the Great Flood of 1938. The photo is from Water and Power's collection of early Santa Monica photos. 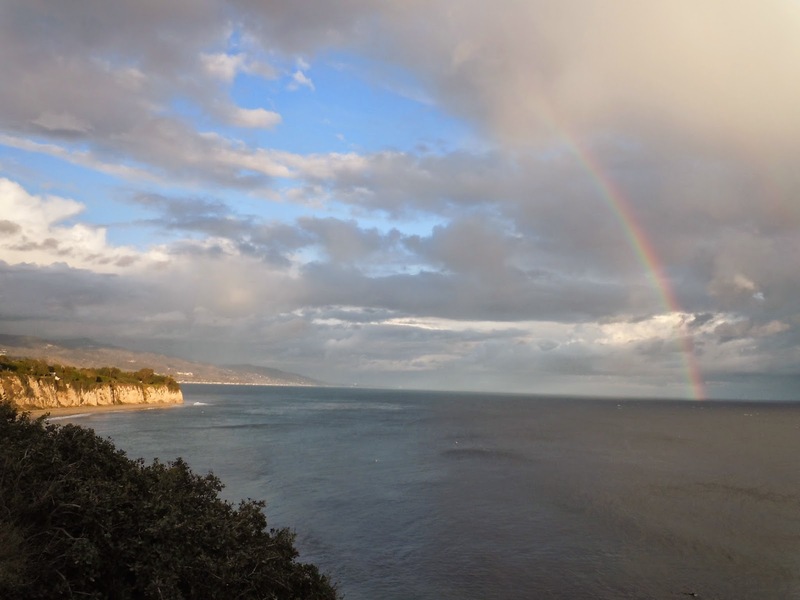 During the 20th century, Malibu experienced major "100-year" storm flooding in 1914, 1934, 1938, 1956, 1969, 1978, 1980, 1983, 1992, 1993, 1995. That's more than 1000 years' worth of 100 year storms in just a century, and the list doesn't include smaller but still destructive storm events. The 1938 flood, a five-day rainstorm that deluged Southern California with 11 inches of rain, was so bad that it rates capital letters: The Great Flood of 1938. That flood is credited with triggering the massive civil engineering campaign to chain the Los Angeles River and transform it, and all its tributaries, into the bleak, sterile concrete channels that are now recognized as one of the biggest ecological disasters in Los Angeles history. Here's another view of the highway. 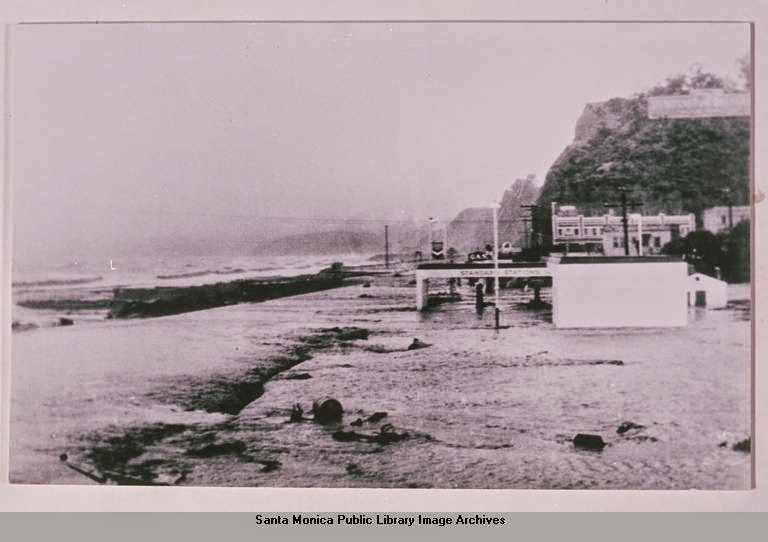 This image is from the Santa Monica Public Library's excellent collection of digital images, and shows PCH before the floodwaters had entirely receded. It took weeks to dig out from the aftermath of the 1938 flood. 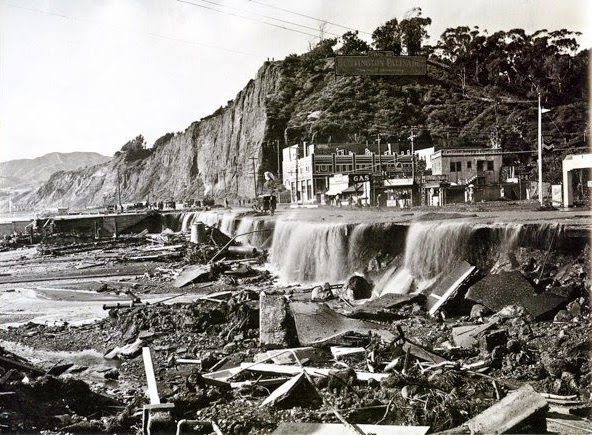 The 1938 flood transformed Santa Monica Canyon into a white-water river that swept everything in its path out to sea. Access to and from Malibu was interrupted for weeks during the cleanup. In January of 1983, high surf and a series of powerful storms swamped a ten-mile stretch of PCH from Malibu Canyon to Trancas Canyon in mud and damaged more than 100 homes. That was the now legendary storm that destroyed the Paradise Cove Pier and badly damaged the Santa Monica Pier. Giant pylons were tossed around like Tinker Toys, and almost every creek crossing in the Santa Monica Mountains was flooded, stranding residents. 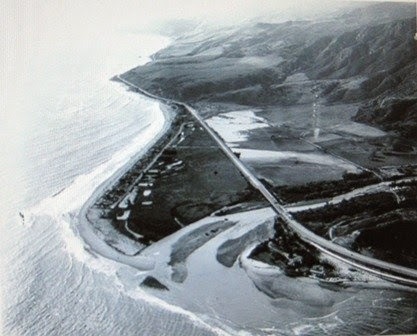 Low-lying areas, including the Corral Beach section of PCH and areas near the Ventura County Line were swamped by waves during a high surf episode on Jan. 19, 1988, but its more common for the road to be closed due to rock and mud slides, rather than waves. 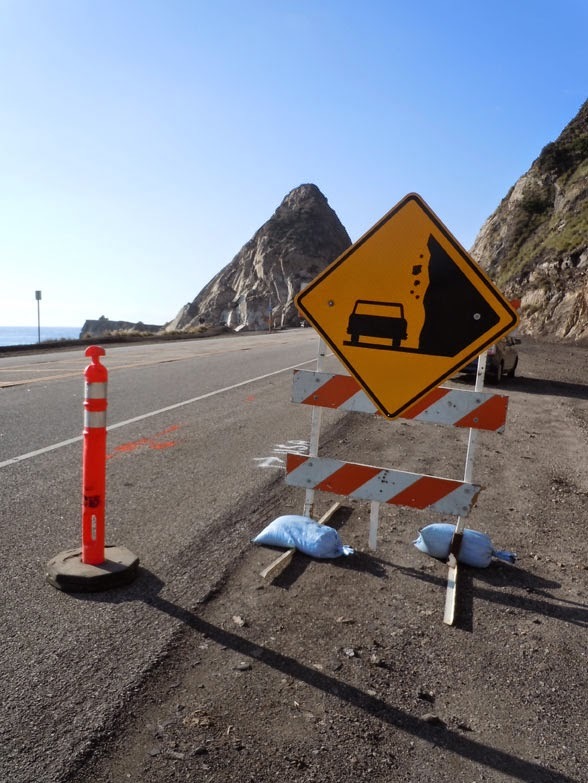 On Dec 20, 2010, long before the Springs Fire, the same 10-mile section of Pacific Coast Highway, from Kanan Dume Road in Malibu all the way to Point Mugu in Ventura County was closed to through traffic while Caltrans engineers and geologists worked to stabilize large sections of coastal bluff. 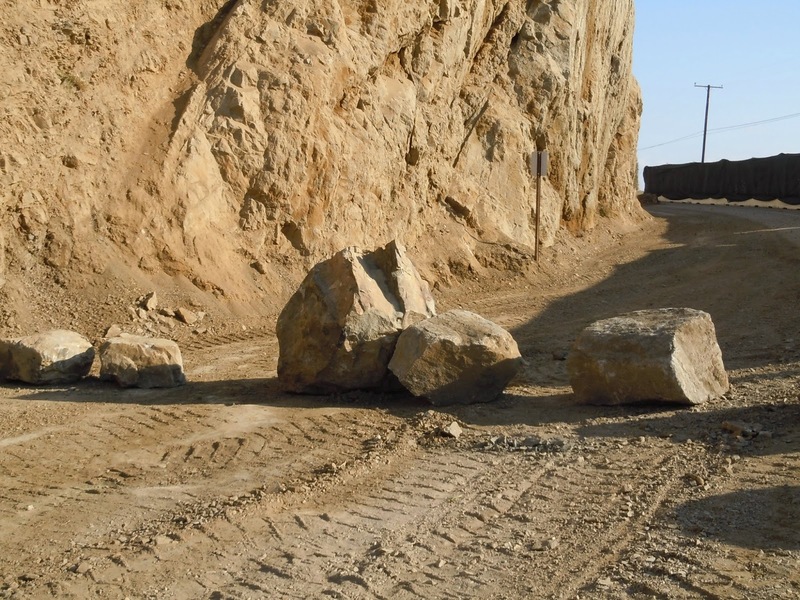 An effort in the late 1970s in the same vicinity involved helicopters positioning metal nets on the cliffside in an effort to mitigate rockslide activity near Point Mugu. Dynamite was used in the 1920s to blast the road through coastal terraces and along the sea cliffs. The precipitous cliffs and geologically unstable rocks continue to make rockslides along this stretch of coast inevitable, but they also occur in more densely populated parts of the coast route in Malibu. 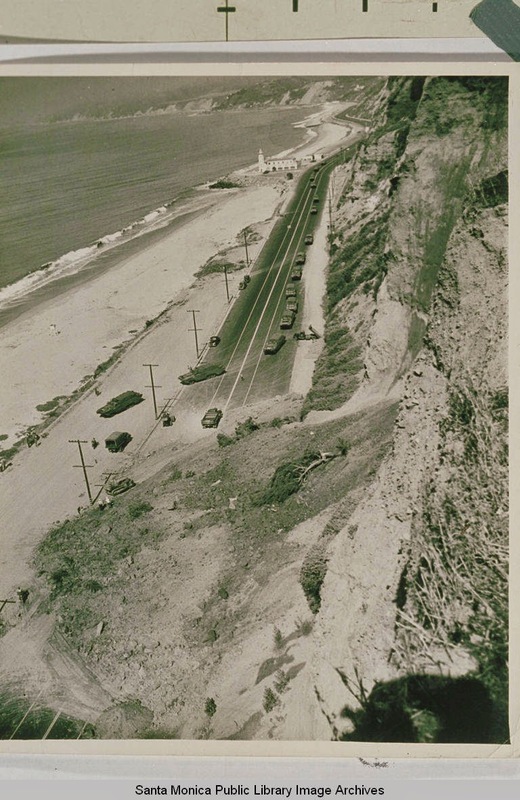 The caption by the Santa Monic Public Library for this 1943 PCH landslide photo describes the trucks clearing the debris as amphibious "ducks." I couldn't find an image from the 1956 slide, but it occurred in the same area. The Oxnard Press-Courier on Feb 11, 1956, reported that “The Pacific Coast Highway was reopened to all lanes of traffic Friday, six days after it was blocked by a landslide [near] Pacific Palisades … Crews remained on the job around the clock since the landslide tumbled tons of dirt from the 275-foot bluff onto a 600-foot section of the highway." The popular story that a quartet of elderly bridge players arrived mostly unhurt at the bottom of the slide when the deck they were seated on separated from its house and slid down the cliff may be apocryphal, but plenty of decks and gardens ended up at the bottom, including a large section of lawn, complete with sprinklers. 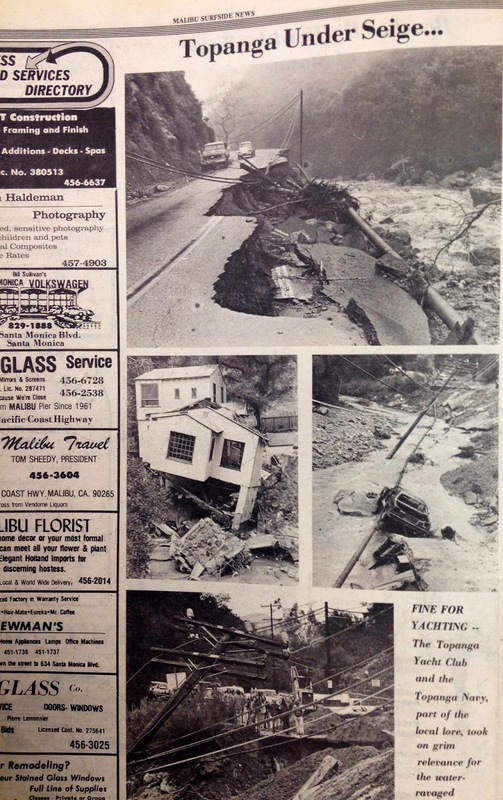 My mom kept a collection of newspaper clippings chronicling the floods and rockslides of 1980. 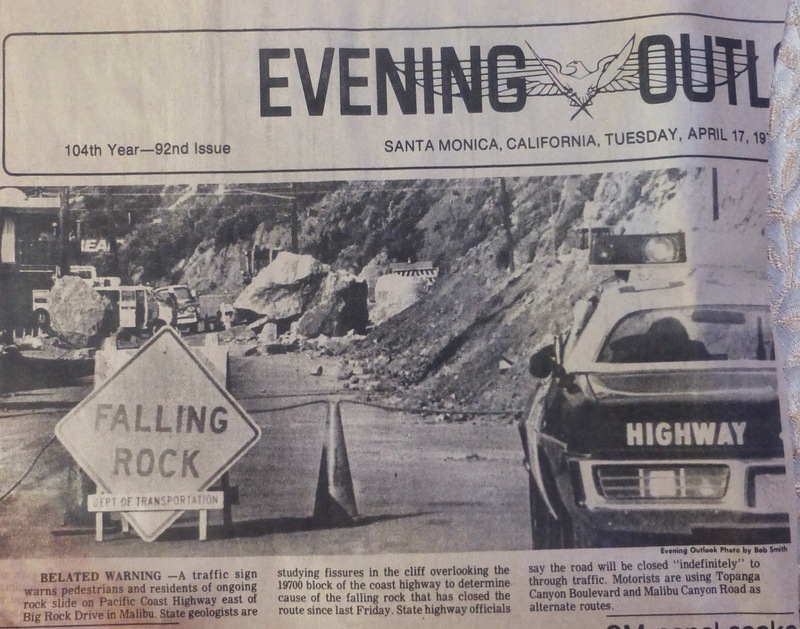 This is the front page of the April 17, 1980 issue of the Evening Outlook, showing the Big Rock slide that shut down PCH for months. The caption warns that the road will be closed "indefinitely." But the rockslide in April 1980 that closed PCH at aptly named Big Rock for more than a month is the one most people remember. Two days after the road officially reopened on May 7, a new slide closed the highway again. “‘The rocks are falling in a steady stream,”’ state department of Transportation spokesperson Milt Stark told the media. The road remained closed for months. A water taxi ferried commuters and visitors from the Malibu Pier to the Santa Monica Pier and back for the duration. Commuters who had access to more than one car left one vehicle on each side of the slide. Others took bicycles with them on the ferry. At least one enterprising resident kayaked past the slide to his parked car each day. 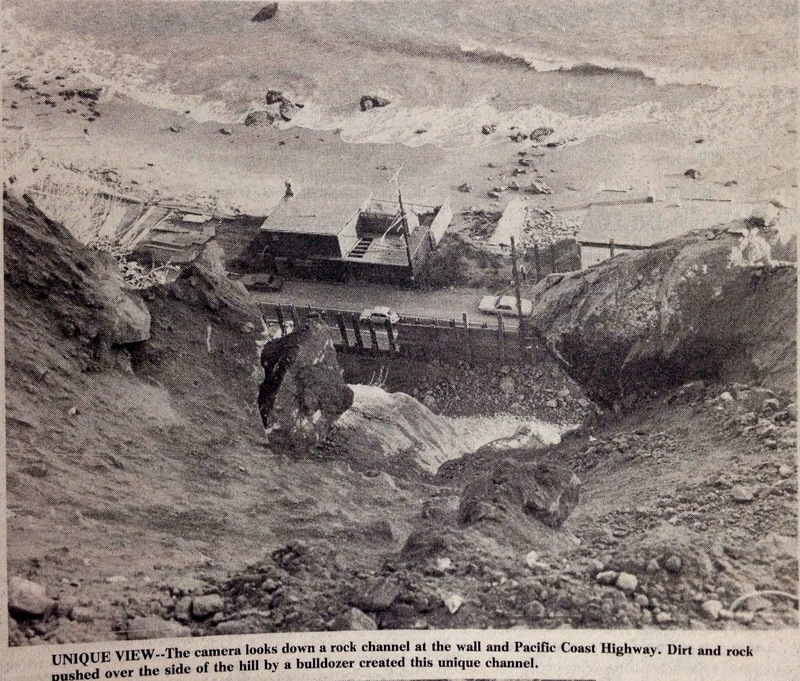 Here's another clipping, this time from the Malibu Surfside News, showing the Big Rock slide from above. I remember taking the ferry to Santa Monica with my parents. It was a marvelous adventure for a child. Watching the coast slip past, arriving at the Santa Monica Pier from the water, seeing the ferris wheel growing closer and closer across the bay, was enchanting. We spent a never-to-be-forgotten day walking around Santa Monica and ate dinner at a long-vanished Indian restaurant on 4th Street called the Gypsy. I got to ride the carousel on our way back to to the ferry. It was wonderful. The water taxi "Shirley Ann" ferried commuters from the Malibu Pier to the Santa Monica Pier while PCH was closed at Big Rock. This is another clipping from the Evening Outlook. For me it was a treat, for the grown-ups it was a major ordeal. And there was no high school in Malibu in those days, so all of the older students had to navigate the road closure on their way to and from Santa Monica High School twice a day, adding extra aggravation to the already-too-long commute. Flooding wrecked havoc in the canyons, too, during the 1980 storms. 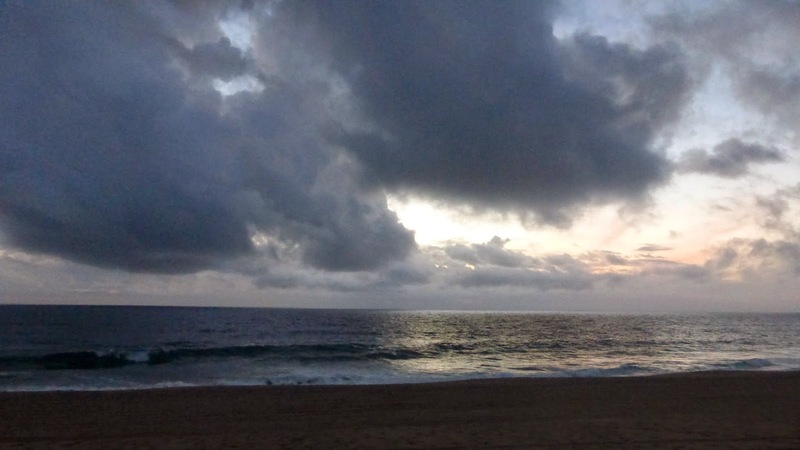 Here are several photos of Topanga from the Malibu Surfside News. In 1980, 300 businesses in Malibu and along PCH sued the state for millions of dollars in loses, alleging that efforts to stabilize the cliff created a more serious problem. Local businesses in the Malibu Civic Center area also had to contend with four feet of water and mud when Malibu Creek overflowed its banks. This clipping from the Malibu Surfside News had especial immediacy for my mom. My family's gallery was located in the building next door, which was on slightly higher ground and escaped the worst of the flooding, but many friends and neighbors had to deal with feet of mud and water in their shops. Combined with the months-long road closure, it was a devastating blow for local businesses. The bulldozer in the photo is right in front of where the high-end chain restaurant MR Chang is currently located. In 1995, severe winter storms again flooded the Civic Center and rockslides closed portions of PCH in Malibu. The Malibu Creek Bridge was damaged during a major storm on Jan. 10 of that year. State transportation officials asked drivers to “avoid Pacific Coast Highway for several months,” while the bridge was repaired and the landslides stabilized. Residents would be escorted by sheriff’s department vehicles through a single muddy lane on PCH while crews worked 24 hours a day to clear the road. I have a vivid memory of traveling past that mudslide, too. This time in my own car, in the middle of the night, waiting in the rain and darkness to be allowed through, and dreading the thought of being turned back and having to drive all the way around through the valley to get home. The mud was so thick that the pavement and k-rails were completely buried except for that one narrow lane. A sheriff's black-and-white that was almost entire covered in mud and a snowplow were on duty, guiding traffic, one side at a time, through miles of debris. Landslide remediation measures have ranged from dynamite to complex barriers of steel and concrete. None of it would be much use in a storm like the 1938 event. Anyone who wants to live at the coast has to learn to live with disaster as well as beauty. It's one of many good reasons why the the City of Malibu's official vision and mission statements talk about the community's willingness to forego urban conveniences. When developers tell us that extensive commercial development will be the salvation of Malibu, or when they propose a 55,000-corpse cemetery in an area with a notoriously high water table, I am reminded of the manically optimistic philosophy of the 19th century manifest destiny movement, which preached that "Rain follows the plow." It's not too different from the newer "if we cover every square inch of a floodplain with development it won't flood any more" mindset. Good luck with that. 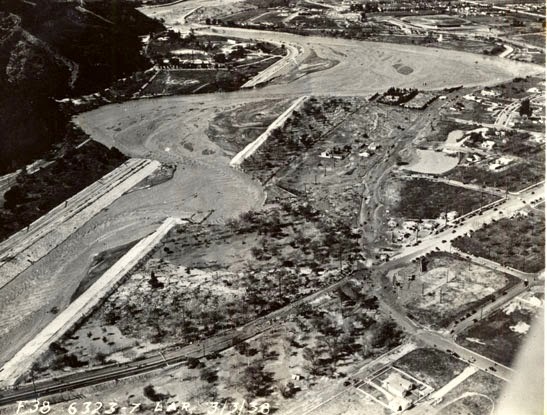 An 1938 aerial photo of Malibu Creek and what is now the Civic Center shows standing water all over the floodplain following the "Great Flood." The lagoon has been entirely washed out and only a small portion of the sandbar, or berm, remains. Just because a flood like this hasn't happened in a while doesn't mean it won't happen again. 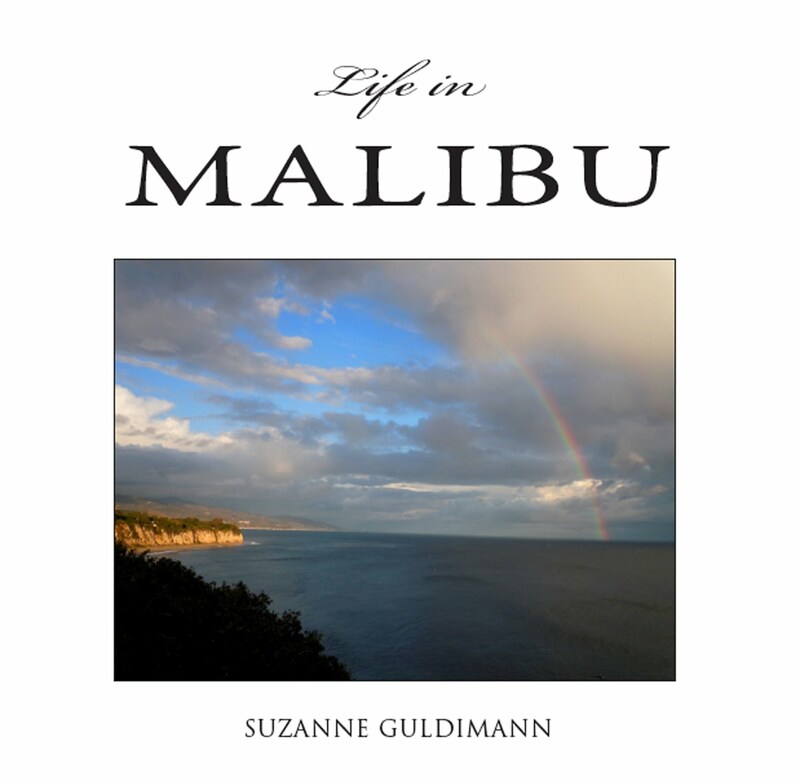 Floods and storms have always impacted Malibu and the Santa Monica Mountains. There is geologic evidence of ancient landslides and flood-related geology. The current storm is a good reminder, even in the middle of the holiday rush, for everyone to check and restock emergency supplies and make sure they have an adequate supply of food, water and medicines for humans and pets. It's also a good idea to review emergency evacuation plans. Becoming familiar with the more challenging canyon roads like Latigo, Encinal and Decker during daylight when it's not raining can be a big help if you even have to drive them at night during a rain storm. We've traded floods for drought in recent years, but the pendulum will inevitably swing the other way again in time. It's too soon to tell if the current storm is the first salvo of a wet winter, or just a temporary break in the prolonged dry spell. Either way, the rain is welcome, but it can be a challenge when it all comes at once. More rain is in the forecast for next week. Be safe out there.